Yes, that's me on the cover of this week's Colorado Statesman Newspaper, talking with my new friend Hugh Hewitt. Is there an iPod service that boils down the days talk radio shows, sort of like Readers Digest does for magazine articles? Or maybe something in writing, a Talk Radio Digest? John sent an email to all of us on the Denver Socrates Meetup mailing list, wanted to discuss a book about religion. I objected, said the purpose of Socrates Cafe was for us to each seek truth by our own lights. Then Dmitri suggested a topic, everything came to a halt. There is something that happens in face to face conversation that is lost online. I'm looking forward to seeing everyone next Thursday. Want to join us? Details and RSVP at http://socratescafe.meetup.com/82. When to Fold 'Em Wondering if you should cut your losses and move on? When the going gets tough, it's often smart to quit. That's the philosophy of Seth Godin, the marketing guru and bestselling business author whose irreverent ideas have transformed how businesses think about marketing and change. His new, brief book, The Dip: A Little Book That Teaches You When to Quit (and When to Stick), discusses business slumps and how to power through them to greatness. Entrepreneur: When they hit a trough, how can entrepreneurs tell if they should tough it out or quit? Seth Godin: If you can't find a measure of your success, of whether you're closer to getting through the dip, you're probably doing the wrong project. For instance, if there's no sign of referral or repeat customers, you won't be better off a year from now. I get a lot of e-mail from businesspeople who are stuck, and they fall into two camps: One is the guy in the supermarket who's always switching checkout lanes--every time he hits a dip, he abandons ship. The other has been working on the same thing for seven years and it's just not getting anywhere, but he doesn't stop. They're both just not hearing what's going on. Entrepreneur: Why is it so important to kill off dead-end initiatives, even if they are bringing in some revenue? Godin: Entrepreneurs don't have a lot of resources, so you can't stick with a product or venture that isn't going to pay off. Entrepreneurs cannot afford to be well-rounded. If you're running anything, from a restaurant to a consulting firm, it's best to be the best at one thing you do. There's a place like this in San Francisco: Cafe Mozart. Nobody goes for the food. You go because it's the most charming place to get engaged. It is exceptional at one thing. Being best in the world is worth more now than it's ever been before. When there are 2 million Google matches for a search, the number-one match gets 10,000 times as much traffic as number 40. The hard part is realizing what your exceptional thing is and switching to that. Entrepreneur: Are there some situations in business where you can avoid the dip altogether? Godin: You should look forward to the dip. The dip is the best thing that could happen to you--if you can get through it, you win, because others will give up. You want to find the dip, and you want it to be pronounced. Whereas if you pick a business like specialty imprinted pens, there's no dip, no barrier to entry. So there's no win. Big Changes with IDEA Cafe. Walter "Wally" Schirra Jr.died Thursday at the age of 84. He was the was the only astronaut to fly in the Mercury, Gemini and Apollo programs. 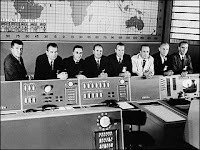 Schirra, far left, the other Mercury Seven astronauts and an operations worker, in white, stand in a NASA control center at Cape Canaveral, Fla., on Sept. 22, 1960. At the time of the photo, I was an 8th grader at the new Thomas Jefferson High School here in Denver. In about 1976 I met him at a party here in Denver. The original astronauts were great heroes, especially to those of us who grew up with them. I had the good fortune to meet 2 of them personally, Wally and Jack Swigert who became an astronaut in April, 1966 and was a member of Apollo 13. I've been leading IDEA Cafe meetings since 1996 or so. We met for years at the Koelbel Library in Littleton, and most recently at Panera Bread at 13th & Grant near the State Capitol here in Denver. At each meeting we invite people to share their startup experience and we brainstorm. Meetings are free and open to everyone who is starting something new, a project, campaign, business, or career. We became a meetup.com group a couple of years ago, and we now meet weekly. We are making some big changes in the meeting format. If you'd be willing to share your startup experience, or if you want a boost as you get started, join us! We just ask that you bring your brain for the brainstorming! For more information see http://ideacafe.meetup.com/1. RSVP "No" if you want to get an invitation to next weeks meeting with when & where we will be meeting. Have you seen the Ben Franklin exhibit that is here in Denver until May 20? Don't miss it! It features Ben's original Franklin Circle, what he called The Junto. I've been forming groups of people with similar learning objectives since 1995 here in Denver, let me know if you'd like more information about the groups I'm now forming. One will focus on the arts, especially music and the theatre, and the other on entrepreneurship and small business. For the details, email me at JohnSWren@aol.com. Chris Phillips who wrote the book Socrates Cafe which inspired the start of the first group in Denver asked me to stand up recently at the talk he gave at Tattered Cover LoDo recently. (The only media coverage of the event was the student paper at Regis University.) The next meeting of our monthly group is next Thursday, RSVP at http://socratescafe.meetup.com/82, or join the group that meets each Friday, 6 p.m. at Panera Bread, 13th & Broadway here in Denver, no RSVP required. Some of us are making an effort to revive the GOP in Denver, even Democrats tell me it's bad for our Democratic-Republic to have one party rule like we now have in Denver. If you'd like to help, join us next Monday at the University of Denver Alumni House. RSVP "No" if you'd like an invitation to future meetings. http://republican.meetup.com/511. Thanks to my good friend Nathan Pollock who recently gave a talk to the Denver South Optimist Club on his adventures in medicine and philosophy. It was by far the best talk we've heard all year, and we've had some great ones! I was recently elected to the Board of the Denver Lions Club. I'm thinking of bundling all my learning groups, seminars, and online publications under the umbrella of Wren University. What do you think of the idea? Would it be too pretentious to put "College President" on my resume and business card? Mary and I are experimenting with an online publication we are calling Denver When & Where. Please let us know if you have events we could help you promote. Leaving York Street will give me more time for my consulting practice. I do business analysis, management services work, and training. Grassroots Educator & Business Consultant. At the University of Chicago there’s a group of scholars who are members of what is called the Rational Expectations school of economics. They believe human beings tend to anticipate unpleasant future events and seek in advance to avoid them. Their teachings do not apply to the Republican Party. Second, there is the corrupting influence of teamism. Being a good conservative now means sticking together with other conservatives, not thinking new and adventurous thoughts. Those who stray from the reservation are accused of selling out to the mainstream media by the guardians of conservative correctness. Third, there is the oppressive power of the past. Conservatives have allowed a simplistic view of Ronald Reagan to define the sacred parameters of thought. Reagan himself was flexible, unorthodox and creative. But conservatives have created a mythical, rigid Reagan, and any deviation from that is considered unholy. Fourth, there is the bunker mentality. Republican morale has been brutalized by the Iraq war and the party’s decline. This state of emotional pain is not conducive to risk-taking and free and open debate. In sum, Republicans know they need to change, but they have closed off all the avenues for change. The tale is not entirely hopeless. McCain seems now to be throwing off his yoke. Newt Gingrich is way ahead of his colleagues when it comes to new ideas and policies. The libertarians and paleoconservatives have been losing for so long they are suddenly quite interesting. There are even a few of us who think it is time to revive the Alexander Hamilton-Theodore Roosevelt legacy. Change could, miraculously, come soon. But the odds are it will take a few more crushing defeats before Republicans tear down the self-imposed walls that confine them.